Fatalities caused by falls from elevation continue to be a leading cause of death for construction workers, accounting for 337 of the 874 construction fatalities recorded in 2014. Additionally, fall prevention safety standards were among the top 10 most frequently cited OSHA standards during fiscal year 2014. 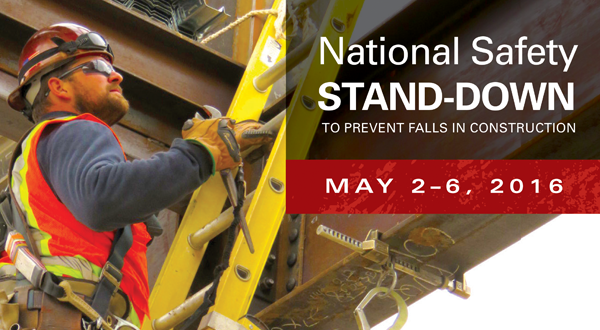 More than 4 million workers participated in the National Safety Stand-Down in 2014 and 2015. This year, OSHA’s goal is to reach 5 million workers. If this goal is met, OSHA will have touched more than half of the construction workers in the country. Participating companies are encouraged to provide feedback to OSHA after their Stand-Downs and will receive personalized certificates of participation. To access details on how to conduct a Stand-Down, as well as training resources, fact sheets and other outreach materials, visit www.osha.gov/StopFallsStandDown.